You want to know how much I love Sriracha chili sauce? I love it so much that I bought matching linens. Ok. That’s kind of a lie. Actually it’s a complete lie. I have no idea where we even got these linens from, but I swear it’s the same rooster. The sriracha people must have not been paying him enough so he had to start modeling for linens on the side. BOOM! I will occasionally go through a phase where I’ll put this stuff on pretty much anything. Soups, salad, meats, whatever. It’s just delicious. 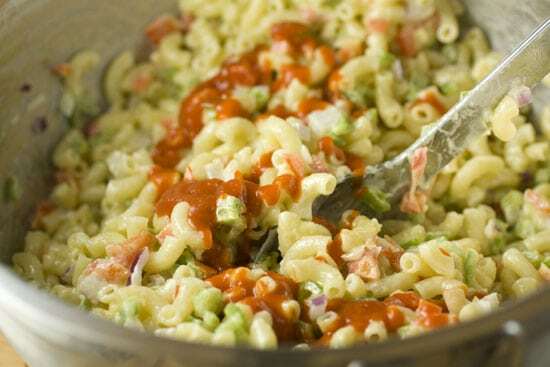 I wanted to make a big macaroni salad to snack on for a few days and figured why not toss in some of the rooster sauce and give it some kick? Macaroni and flavorful veggies mixed with homemade mayonnaise and spicy Sriracha sauce. The perfect picnic side! 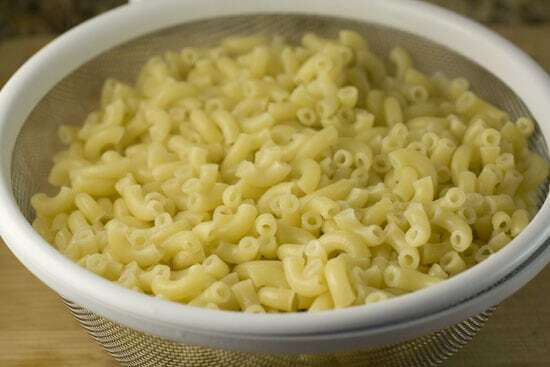 1) Cook macaroni al dente. Drain and drizzle with a bit of olive oil. Stir to make sure it isn’t sticking. 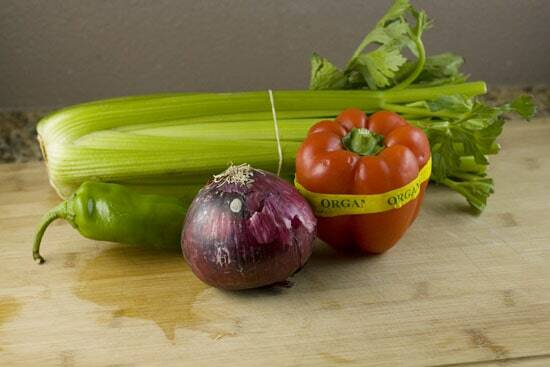 2) Dice veggies to an equal size. 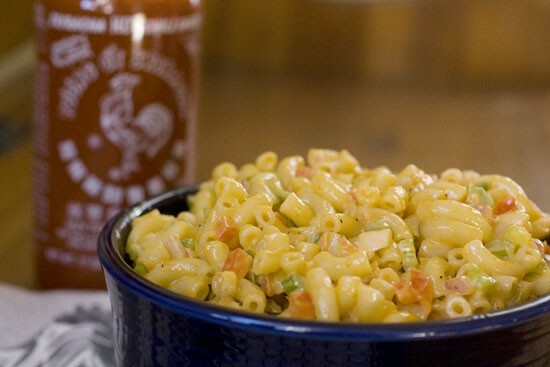 3) Add veggies to macaroni along with mayo and chili sauce. 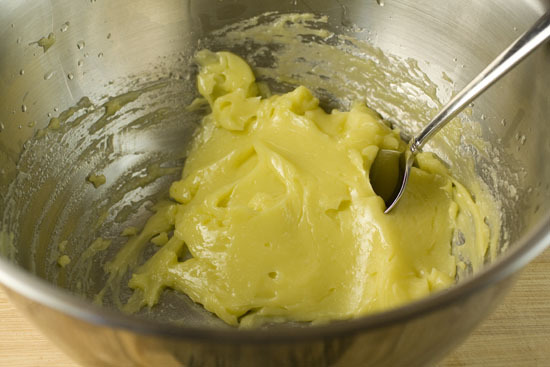 4) Start with a small amount of mayo and sauce and work up to the desired amount. Taste frequently. 6) Keeps in the fridge for 4 or 5 days without a problem. When I was shopping for the ingredients for this dish I noticed that my local grocer carries pre-made macaroni salad in the deli section. What I loved about it is that you could barely even tell it was macaroni salad. Good thing it was labeled! It was basically just pasta swimming in a sea of gloppy sauce with a few small chunks of veggies. It was more soup than salad. If you’re going to make real macaroni salad, the two things that you need to get right are the macaroni and the mayo. For starters, be careful not to overcook your macaroni. I find that mine cooks faster than the package says, so keep an eye on it. It shouldn’t be soggy at all. Al dente is the technical term. When it’s done, drain it and drizzle it with a tiny amount of oil so the pasta doesn’t stick together. When it comes to the mayo, I really encourage you to try to make your own if you can. Homemade mayo is leaps and bounds above any store bought version I’ve tried. If you simply refuse to try that though, go light on it to start. The mayo should be a light coat on the macaroni. The macaroni should, at no point, be floating. What’s nice about homemade mayo is that it’s so flavorful that you can get away with using a lot less of it. I like to pack in a lot of veggies in my pasta salad. Good fresh crunchy ones are the way to go. You can use almost any veggie that you like really. I went with four of my favorites. You could get crazy here. The key to veggies in a salad like this is to try to get them all basically uniform. 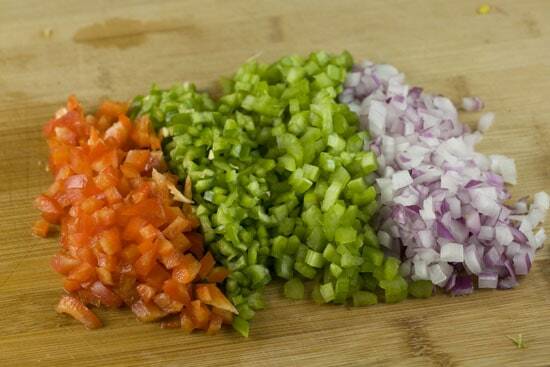 Take your time dicing (it’s good practice). The last thing you want is to get a big chunk of red onion or something. They should all be roughly the same size regardless of what veggies you are using. Oh. And don’t forget the Sriracha! I’m so addicted to this stuff. I can blow through a bottle in a week or two if I’m really in a sriracha mood. Basically just stir all this stuff together! I like to add the mayo last and add it about 1/4 Cup at a time. You don’t want too much and it’s hard (read impossible) to remove mayo from a macaroni salad. When it comes to the chili sauce, start light. I’d recommend about two tablespoons. Then stir it and taste it. I used about four in my version, but like I said, I have a problem. Also, keep in mind that the salad will get spicier if you let it sit overnight. This is perfect for a picnic or for lunch. Pile it high and deep! I’m generally not a huge macaroni salad fan, but I could almost eat my weight in this stuff. Watch out for that rooster though. He’s a spicy one! 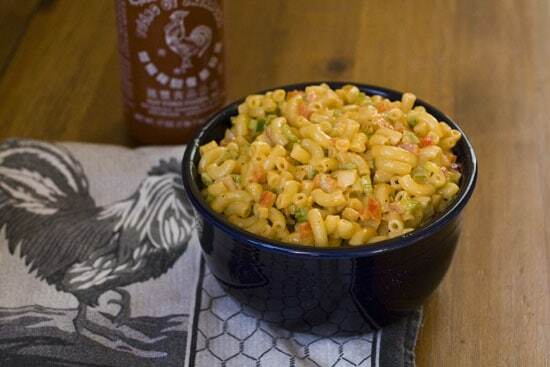 Using a related ingredient list, mac and cheese (from-scratch or yummy Stouffer's) can be made brilliant with the addition of a pint of well-drained fresh salsa embellished with a dash or two of the Rooster. Bake it up, a quick broil of the top, with or without fresh buttered breadcrumbs, and you're on you're way to pasta Nirvana. Thank god Sriracha is sold worldwide!!! Love this stuff! Try using the FP, it makes easy work of mayo. From one scaredy cat to another, I have to tell you, I tried that homemade mayo recipe the other day to put on this salad. I was nervous but it was really straightforward, and I paid attention to the cautionary words of only adding a few drops at a time, until my arm was going to fall off… and it was worth it. Hope you have a good experience with it too! My only problem is that the rest of my family doesn't like sriracha except in very small amounts. I love the stuff and would use it in more applications like this and more of it too. 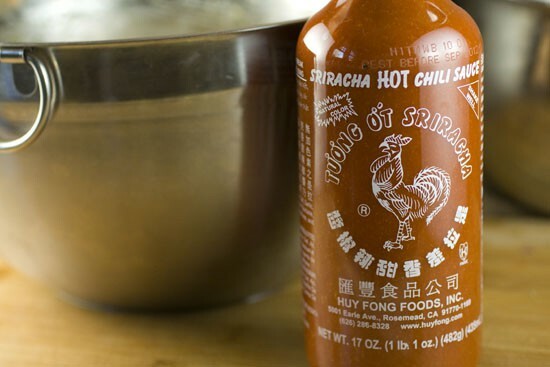 This sounds so good, I love sriracha! I have a slight problem with hot sauce, too. I made this the other night and fell madly in love. THANK you! I totally agree about the scary awfulness of too much mayo in a macaroni salad. With the added spice of the sriracha to cut the richness, the light coating of mayo was really perfect in this one. Great idea, SO yummy. Seriously, made this for dinner last night and three adults ate nearly a pound of pasta. It was so good!